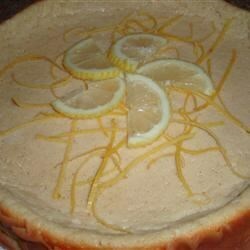 "This ricotta cheesecake is similar in style to an American cheesecake, but is much lighter. Enjoy." Preheat oven to 300 degrees F (150 degrees C). Set rack in the middle of the oven. Butter and flour a 9 1/2 inch springform pan, and tap out excess flour. Place the ricotta in a large mixing bowl, and stir it as smooth as possible with a rubber spatula. Stir the sugar and flour together thoroughly into the ricotta. Stir in the eggs 1 at a time. Blend in the vanilla, cinnamon, orange zest, and salt. Pour batter into the prepared pan. Bake in the center of the oven for about 1 1/4 to 1 1/2 hours, until a light golden color. Make sure the center is fairly firm, and the point of a sharp knife inserted in the center comes out clean. Cool on a wire rack. It will sink slightly as it cools. Cover, and chill till serving time. Nix the Cinnamon, orange zest and salt and add 1/3 cup of Amaretto. I use DiSoronno. It will need to cook about 10 to 15 minutes longer. This is how real Italian cheesecake is made! Bona Petit!